I was wondering, that why don't we add a 'General Statistics' to each member's profile, that includes a bar chart for that shows when each member, between every hour and a 'Total Time Spent Online', this recording how long in days and minutes, how long each member has spent on the forum? This wasn't here when I joined. I thought the favourite teams is still here? I never saw the green / grey / red bar. It must have disappeared before I joined F1GRID. Yes, I agree with you. The favourite team should be displayed else where and not just on each member’s profile. That disappeared with the new thread layout I believe. There was just no space for that. We don't have a postbit (that's what the space below the avatar is called) any more. We could add that statistics to the avatar popup menu. @Brad P What do you think? Yes, that did disappear when the current forum layout was introduced. If you ask me though, SThomas and Brad P, I would like to see it come back. I suggest you re-read your post, VFan17. You are missing a word. 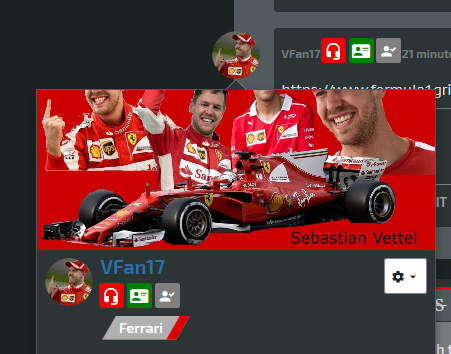 So the circle around the member's profile image is the colour of their favourite Formula 1 team? I like that idea. It's cool. We are not limited to one option, but yes, the circle is one possibility. It would indeed indicate the favorite team. Where would you put the bar in? As mentioned, we don't have a postbit any more. It does not fit in the avatar popup either. So the only option would be the menu in the right top corner where we have the statistic already, just with numbers, I believe. "I was wondering, that why don't we add a 'General Statistics' to each member's profile, that includes a bar chart for that shows when each member, between every hour and a 'Total Time Spent Online', this recording how long in days and minutes, how long each member has spent on the forum?" I would like to see the favourite team colour circle, around the profile image. What do you mean by "postbit"? Having pressed the menu at the top right (the first picture on SThomas's post with three pictures) maybe we could just add another line under that and incorporate F1Fan1's idea of time spent?